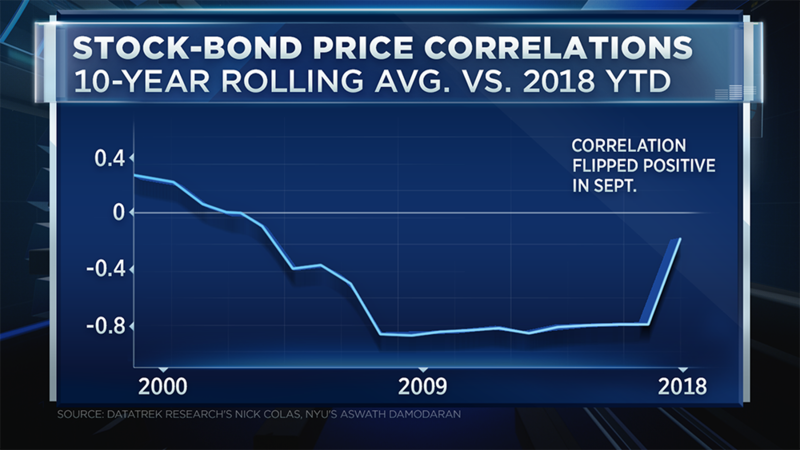 His latest research shows that the two assets became positively correlated in September, a trend that's rarely been seen over the past two decades. 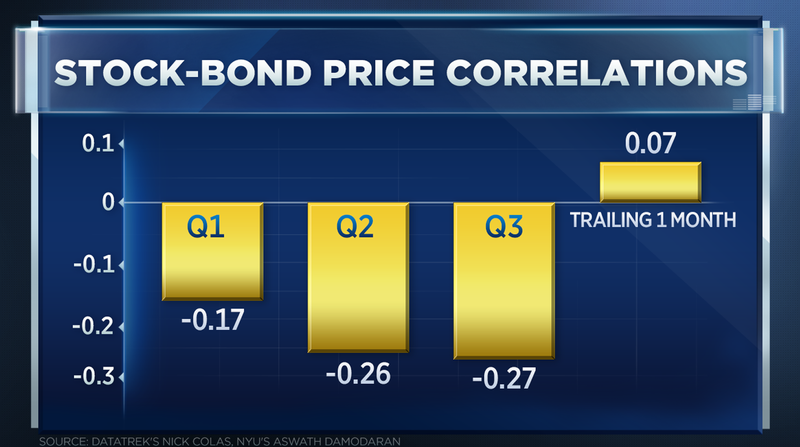 "A lot of portfolios over the last 20 years have gotten built on the notion that when stocks go down, bonds go up," he said Wednesday on CNBC's "Trading Nation." "It has stopped working this year." "The upshot is we're going to be looking for a lot more volatility in balanced portfolios, and investors will feel a lot more volatility than they have historically," Colas said. The major indexes tumbled Wednesday. The S&P 500 and Dow fell more than 3 percent for their worst day on a percentage basis since Feb. 8. The Nasdaq plummeted 4 percent for its worst day since June 24, 2016. The Cboe Volatility Index, which measures volatility, surged above 20 for the first time since April. Yet, Colas doesn't believe the latest activity is the death knell for the record stock market rally. Despite the correlation and uptick in volatility, he's not calling for a prolonged deep sell-off or recession to hit the U.S. over at least the next 15 months. However, a big question remains. Can investors stomach the ride? "Investors will feel a lot more risk than they have over the last two decades. It's a very important change from the last 20 years," Colas said. He sees two options that could mitigate the effects of the broken correlation. "Reduce the length of the bonds that you own. So, shorten duration," Colas said. "The second choice is just use cash as your bond allocation for a while. You're getting 1.50 to 2 percent in cash."